For a dozen years I was an LDS Home Teaching companion to a fellow who was mentally handicapped. Harold was a wonderful man, full of childlike humility and love. His large stature was balanced by an equally large, continuous and genuine smile. His not always intelligible speech would always be clarified by his patient and repeated attempts to convey what he knew he was saying. But said in “Haroldspeak,” it would take more than a few attempts for me to understand. Harold passed away this past week. My wife and I, along with my little dog, Buddy Wu LI (He is a Schipperke, a Belgium barge dog), drove the 4 hours to St. George (Utah) to participate in and attend his funeral. I was privileged to say a few words. With my guitar, I sang a slightly altered version of the Mormon Primary song, “I Am a Child of God.” The funeral was not a sad affair, more a celebration of a special man. Indeed special: the first mentally handicapped boy in Utah (perhaps in the entire country) to earn the Eagle Scout Badge. Having a certain belief in Life after earthlife, I know I will one day reunite and celebrate with a now perfect, whole, and precious man. Having earned, through my alcoholism and addiction, membership in the “Least of These My Brethren,” club, daily encounters with this “social class” are more pronounced. When I left the store, I had to get the man’s attention to hand him the few dollars change I had. He immediately recognized me as the man who was “walking the little black dog and playing the guitar in the grassy area near the rest stop.” I had taken a moment to tune my guitar and practice the song I would sing at the funeral. His intelligent response and keen attention was unexpected. He said, “Do you have a leash for your dog?” I replied in the negative as I never put Buddy on a leash. He is more than obedient to my every command and request. The fellow reached into his bag and pulled out a quality retractable dog leash and offered it to me with the explanation that he had picked it up when someone had left it at an earlier rest stop. He had kept it thinking maybe he would encounter a stray dog in his travels. He offered it to me. I mumbled something about Karma and went back into the store for a bag of chips. I had to leave quickly. He would have noticed the tears in my eyes. I really wanted to just hug him and tell him that in Surrender to God he would be protected and things would be OK. With my purchase, I obtained some cash and, upon leaving the store, handed the man enough money to help him a little on his way. As I walked back to my car, I felt an almost overpowering love for this, just moments before, stranger. His parting gentle “Bless you” echoed through my mind as I drove away. I am sure I will never forget his sad eyes. Truly–he had blessed me; and, surely–He had blessed me! Remaining at this facility for a week, I began to feel alive again. The staff had been extraordinary in their encouragement. Leaving treatment “bright-eyed and bushy-tailed,” I felt a renewed commitment to my wife, to the clinic, and to myself that I would never, ever drink again. My wife told me that, promise or no promise, she would no longer stand by and watch me die. But this time, I was confident. I was convinced I had reached the lowest bend of the alcoholic pipeline and was heading up the recovery side. I was wrong. “Never, ever” is too long a time for an alcoholic to commit to. Two months later, I checked back into the same treatment facility. I was crushed. I was certain there would be no more chances with my wife. I knew there shouldn’t be. The fact that I had let her down was one thing, but there was more. The National Guard had relieved me from duty—permanently! Then, following a medical exam at the treatment center for a painful hip, I was informed that, at the young age of forty, I had degenerative arthritis. If I wanted to continue walking, I would need a total hip replacement! “You have to hit your bottom,” the Old-Timers say. Like the funny little fellow with the big ears at the Alcohol Recovery Center had advised me many years earlier, “You have to be willing to crawl through cut glass to get sober!” Well, shattered glass was all around. I had hit bottom directly in the middle of it. I knew I had. I hit my bottom like a concrete block plunging through a twelve-story building, shattering glass as it went. When I hit, I didn’t even bounce—I just crunched into a lifeless heap. More than a degenerative hip joint, I was a degenerative disease—degenerative addiction, degenerative marriage, degenerative soul. Depression rolled over me like the waves of a dark, stormy ocean. Heavy and suffocating, my condition was more than I could bear. I had no more tries left in me. I despaired. I prayed. My prayers were unlike any I had ever uttered. I didn’t ask for anything. Not to stay sober. Not to have my job back. Not for my wife to stay. Not to feel peace. Not to remove my pain. Not for anything! I was conquered. All I could do was mutter words about my total nothingness and cry out for help. I began to feel tiny stirrings within me—a feeling of warmth, barely detectable, as if a tiny penlight had turned on in my bosom. A powerful key turned. Somehow, I knew in my heart that it could be over. I stood at that point I had heard described in hundreds of AA meetings—the testimony of myriad alcoholics who had hit bottom and had found the only way up: “Half measures availed us nothing. We stood at the turning point. We asked His protection and care with complete abandon.” (From Chapter Five of Alcoholic’s Anonymous). I knew I didn’t possess the ability to manage all of my life. I couldn’t even manage a small piece of it. I suddenly understood that if I could just focus my energy on today, turning the guilt of yesterday and the fear of tomorrow over to God, then this terrible ordeal could be over. Like finding and putting in place a long lost, last piece of a puzzle, the picture became clear. I understood what to do. My life could be pieced back together—I simply needed to do it in humility and surrender—and one moment at a time! “Who has the greatest reason to be thankful to his God–the man that has no strong passion or evil appetite to overcome, or the one that tries day by day to overcome, and yet is overtaken in a fault? Who has the reason to be the most thankful? The being that has comparatively no strong passion to overcome ought constantly to walk in the vale of humility, rather than boast of his righteousness over his brother. We are under obligation, through the filial feeling and ties of humanity, to more or less fellowship those who do evil . . . If brethren and sisters are overtaken in faults, your hearts should be filled with kindness–with brotherly, angelic feeling–to overlook their faults and far as possible. [Teachings of the Presidents of the Church: Brigham Young, (Salt Lake City: The Church of Jesus Christ of Latter-Day Saints, 1977, page 180)] Emphasis added. His Holiness offers the cure–and he does so with so much love and conviction! Can we not practice and train ourselves daily to comply? Observe everything – judge nothing. I offer this teaching with the deepest of love and gratitude to each of you. Official website of author and life-coach Phil Simkins, Perfect Brightness LLC. 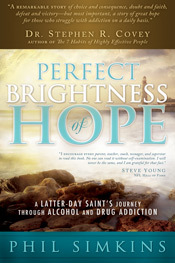 Perfect Brightness LLC Perfect Brightness of Hope is published by Cedar Fort, Inc.